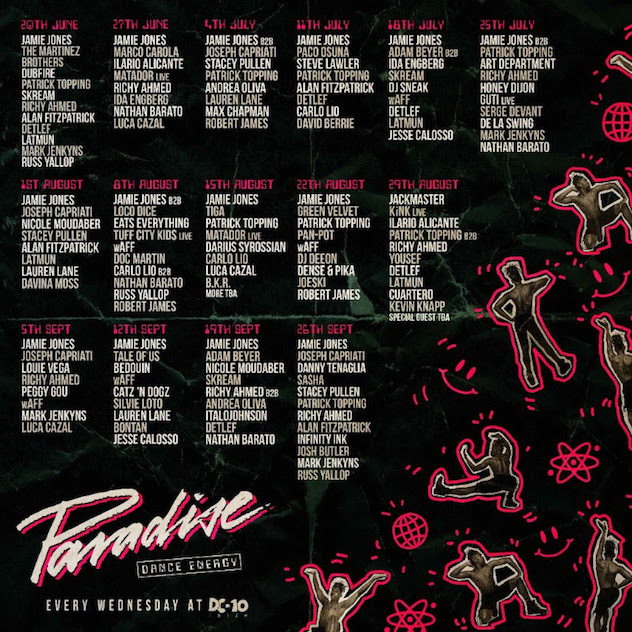 Jamie Jones’ Paradise Ibiza party series has unveiled its 2018 line-ups, with sessions set to start at DC-10 on Wednesday 20th June, finishing up on Wednesday 26th September. With this year marking 30 years since the acid house-fuelled Summer of Love in 1988 the season comes with a loose theme— the history of dance music. Adam Beyer, Art Department, Carlo Lio, Doc Martin, DJ Deeon, DJ Sneak, Danny Tenaglia, Stacey Pullen, KiNK, Eats Everything and Yousef are amongst those down to play. The opening party will involve an early start— 6PM— and sees main man Jones going up with The Martinez Brothers, Dubfire, Patrick Topping, Skream, Richy Ahmed, Alan Fitzpatrick, Detlef, Latmun, Mark Jenkins and Russ Yallop. Paradise also appears in our recent feature on possible heirs to dance music’s biggest empires, and just announced a huge residency at Wynn Las Vegas in the US.